Need an iPad Case? Get one Personalized! Did you get an iPad for Christmas? You are so stinkin' lucky! I bet you are feeling like you are holding a new baby? Well, you are! Now you need to wrap in something comfy, safe and personalized and we have beautiful leather ipad cases for you! They come in your choice of black or grey leather! 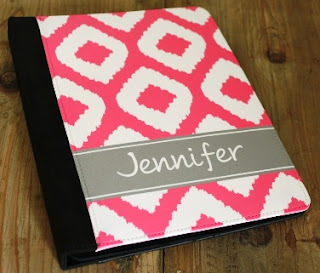 Our personalized ipad cases will feature your name, monogram or sorority on them! These cases fit the iPad 1, 2, & 3 and are as functional as they are beautiful! They come in your choice of 50+ cute designer patterns! Gorgeous iPad case designs by Clairebella are featured for sale at CarolinaClover.com.